Among the many iconic images of Yoko Ono, there is one that is particularly haunting. Taken in late 1969, she and her husband John Lennon have embarked on their worldwide “War Is Over” campaign. They are huddled together behind a giant placard bearing that mantra, dressed in all white. Her long black hair is parted in the middle, framing her face like draperies. But it is her eyes that are most evocative– dark pools of sadness and mystery. Though the sign and Lennon occupy the foreground of the photograph, she is its undeniable center, a subliminal message that her husband would have readily acknowledged. Long before she met John Lennon, there was Yoko Ono: avant-garde performance artist, poet and musician, a fixture on the creative scenes in New York and London. But after that legendary first encounter with Lennon at a London art gallery where she was prepping for a show, Ono and her work began to be subsumed by his fame, becoming the target of racism, sexism and outright bullying by the press and public. Vilified as a Japanese “dragon lady” who broke up the Beatles—compare the public’s perception of her and the blonde-haired, American-born Linda Eastman, who married Paul McCartney—she was written off as an untalented opportunist. Her music, with its aggressive lyrics and wails that presaged the sounds of punk and new wave, was derided as unfeminine and lacking artistic merit. In a telephone conversation from her longtime apartment at the Dakota in New York, Ono takes a deep breath as she reflects on those times and her identification with the gay community. 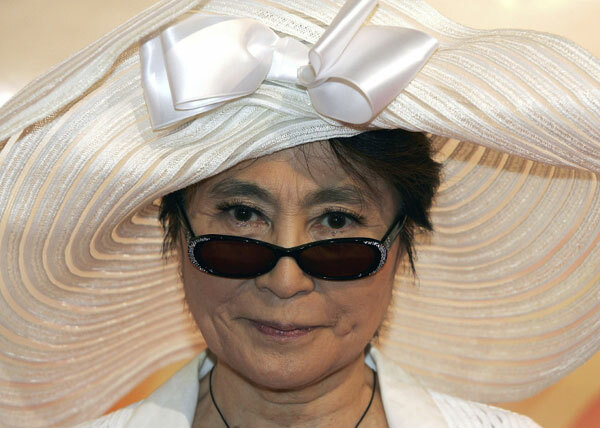 With her turbulent life story and support of LGBT issues, Ono deserves to be included in the great pantheon of gay icons. A reworking of “Every Man Has A Woman Who Loves Him” from the Grammy-winning Lennon/Ono album Double Fantasy, the single featured updated, gay-centric lyrics: “Every man has a man who loves him” and “every woman has a woman who loves her.” Remixed by Blow Up, the song rocketed to No. 1 on the Billboard Hot Dance Club Play Singles Chart. She has even taken the stage with Lady Gaga, who has cited Ono as one of her primary influences, performing a dramatic set that included Ono’s “The Sun Is Down,” which has garnered nearly 285,000 views on YouTube. In the decades since his tragic murder on 8 December 1980, Ono has continued their joint legacy of social justice. Yet she has also remained devoted to her own art—the music, of course, but also visual works such as the Wish Tree, which she has installed in cities across the globe. At these sites, visitors are invited to take a pencil and write a wish on a paper tag, tying it to the tree. In the winter months, they are directed to whisper their wish to the tree instead. Jason Howard is a freelance journalist whose commentary on LGBT issues has been featured on NPR. He is the editor of the forthcoming anthology “The Women We Love: A Gay Homage,” which will be published in 2012.